1975 was a great year for the Firebird Trans Am in styling. It was the first year for the more expensive wrap around rear window. This Trans Am has been repainted a gorgeous candy apple red, sits on 17in honeycomb wheels with low profile tires, new decals all around and a rebuilt suspension to back it all up. This car feels very solid and hugs the ground nicely around corners and bends. The interior looks to be all original and shows very little wear. A new headliner and dash gauge bezel look as though they were replaced recently. Complete with all the factory gauges, 8 track and stereo this car is unmolested and not cut up. The red vinyl buckets seats are very comfortable and sit down nice and low. The car is very quite when driving down the road and has very minimal clunks or vibrations. The engine bay is all original and appears to be unrestored. The 400 motor runs and sounds great. The 3 speed automatic shifts smooth and feels nice and tight. Overall, if you are looking for a nice stock Trans Am with great looks, handling, power and comfort look no further! The 1975 Firebird Trans Am Hardtop Coupe had a base price of $4,740 which was nearly $400 more than the Firebird Formula. The Trans Am had an aggressive stance, flares, spoilers, shaker hood scoop, extractors, and the distinctive Firebird decals. Power was sourced from a 400 CID which was replaced mid-year by the code Y, 455 CID V8. Due to safety and emissions, the only transmission available was the M38 Turbo-Hydramatic. Features found within the Trans Am included AC, tilt steering, power brakes, and power steering. 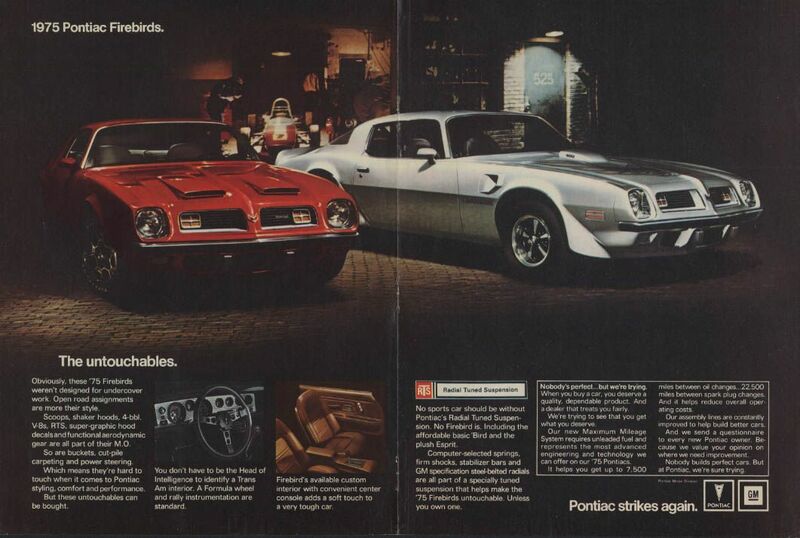 For 1975, Pontiac produced 27,274 examples for the Trans Am.